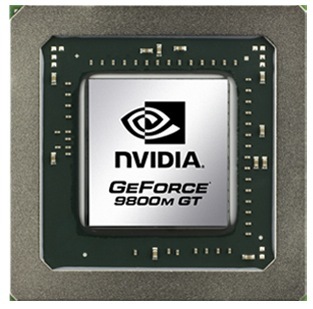 The Nvidia GeForce 9800M GT is a graphics adapter for laptops and is based on the 9800M GTX (G92 core), but with only 96 shaders instead of the 112. The 9800M GT is produced in 65 nm and is therefore more similar to the 8800M GTX as both cores have similar shader counts. The chip is intended for relatively large desktop replacement laptops with more powerful cooling. Similar to all cards with DirectX 10 capabilities, the GeForce 9800M GT renders 3D images using "Unified Shaders". There no longer exists any dedicated pixel- and vertex shaders. Instead, 96 so-called stream processors handle most of the the graphics work previously done by vertex and pixel shaders. Furthermore, these shader units are clocked higher than the core GPU processor. The performance of the 9800M GT is similar to the Geforce 8800M GTX (same specs). The GTS 360M with GDDR5 and the 9800M GTS both with higher clock speeds) also perform on the same level as the 9800M GT. Therefore, the performance of the 9800M GT in 2008 and 2009 was sufficient for most games in high details. A detailed performance analysis of the 9800M GT can be found in our 9800M GT review. An advantage of the GeForce 9000 series is the integrated PureVideo HD video processor. The GPU can assist the CPU in decoding H.264-, VC-1-, MPEG2- and WMV9 videos. In conjunction with the Nvidia 9100M G integrated graphics, the 9800M GT supports Hybrid-SLI in the form of HybridPower. HybridPower is a Windows Vista-only technique to switch between the integrated and dedicated graphics core for power-saving purposes. Up to now, the user had to use a tool to switch between the GPUs. Eventually, graphics switching can be done automatically in drivers (now known as Nvidia Optimus). GeForceBoost is not supported with this card as there would be no performance gain from combining the integrated GPU with the 9800M GT. Compared to desktop graphic cards, the 9800M GT is most similar to the GeForce 8800 GS. The latter, however, still features higher memory clock rates and has a slight edge over the 9800M GT.